Samsung's 4-inch "Super AMOLED" displays, found on the company's Galaxy S line of phones, are the best screens on any phone. This year Samsung raises the bar even higher with two new phones, the Infuse 4G and 4G LTE, that boast a "Super AMOLED Plus" display with higher contrast and better viewing in bright light. 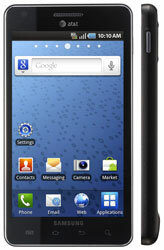 The Samsung Infuse 4G (for AT&T) will be targeted to media junkies, with a giant 4.5-inch Super AMOLED Plus display (450 x 800). At the same time, the Infuse 4G will also be the thinnest smartphone in AT&T’s stable. As for the rest of the phone's specs, they're not too shabby either. The Infuse 4G has a 1.2Ghz processor (an upgrade from the Galaxy S line at 1GHz), uses AT&T’s HSPA+ network (which isn’t technically 4G, but it’s still plenty fast at 14.4 Megabits per second) and runs Android 2.2 (Froyo) software. Also onboard are two cameras, a 1.3-megapixel front-facing camera and a rear-facing 8-megapixel camera with autofocus and flash. Slightly smaller than the Samsung Infuse 4G, the Samsung 4G LTE (for Verizon) will have a 4.3-inch Super AMOLED Plus display. And as its name suggests, it operates on Verizon’s 4G LTE network, plus it runs Android 2.2 (Froyo) software and has a 1Ghz processor. Also onboard are two cameras, a 1.3-megapixel front-facing camera and a rear-facing 8-megapixel camera with autofocus and flash. The phone will come preloaded with Swype virtual keyboard (a favorite of ours) and other apps that are specifically designed for the LTE network, including Skype video chat. Availability and pricing have not yet been released, though my money is on $199.99. I thought the verizon 4G Samsung phone was the Schwing!